Recap of ELAN’s January Open House! https://www.quebec-elan.org/wp-content/uploads/2018/11/Featured-Images1.png 317 843 ELAN Communications https://quebec-elan.org/wp-content/uploads/2016/08/elan-final-logo-banner-1.png ELAN Communications2019-01-30 20:39:502019-01-31 16:01:45Recap of ELAN's January Open House! Guy Rodgers with John Hobday (Independent Arts Consultant who has worked for Canada Council for the Arts, the Samuel & Saidye Bronfman Family Foundation, CBC, and more) at State of the Arts in 2011. Fifteen years ago, the Quebec Arts Summit brought together 150 artists and cultural workers to take stock of an English-language cultural renaissance that had become noticeable after the referendum of 1995. The rapidly growing number of English-artists choosing to live and work in Quebec was a revelation, and the inspiration for ELAN’s creation. Seven years later, in 2011, ELAN organized State of the Arts, a three-day gathering of artists and cultural workers from all disciplines and from many regions of Quebec. Principle activities took place at la Société des arts technologiques (SAT), where 100+ community leaders discussed challenges and opportunities, debated strategies and brainstormed innovative ideas. Satellite activities took place at Centaur Theatre, the launch of the book Minority Report: An Alternative History of English-Language Arts in Quebec, and a series of thought-provoking panel discussions at la Maison du Conseil des arts de Montréal. In February and March, ELAN is hosting a new edition of State of the Arts. The emphasis is on diversity and inclusion. At our 2011 event, our priorities were to connect with younger artists, newly emerging disciplines, and artistic communities outside Montreal. In 2019, project manger Farah Fancy has expanded the consultation format to include small group discussions and personal consultations around Quebec to engage a more diverse group of people in the conversation. With the assistance of Emily Enhorning, ELAN’s Membership Coordinator, Farah has also prepared two short surveys that we encourage you to take. One of the surveys is for individual artists living in Quebec and the other is for arts and cultural organizations. Each survey will only take a few minutes to complete. The English-speaking arts community in 2019 is distinctly different than it was 15 years ago. ELAN was founded by artists whose references were rooted in 20th century issues of official languages and historical tensions between the two solitudes. That has been a significant part of our mandate and we have made significant progress. The 21st century has brought new challenges and opportunities. This edition of State of the Arts signals a turning point for ELAN, in part a generational transition, and in part a valuable updating of ELAN’s mandate and mission for current and future members. We hope you’ll be part of it. ELAN & LEARN are seeking proposals from Communications Specialists! 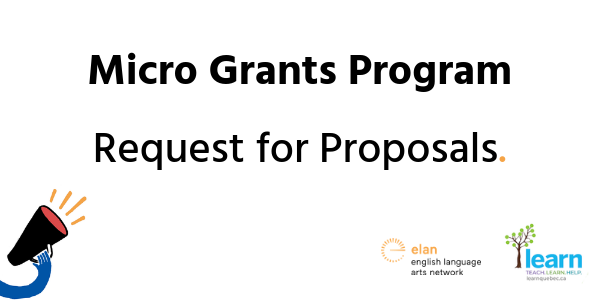 ELAN & LEARN have teamed up to manage the Government of Canada’s Community Cultural Action Fund Micro-Grant Program for Minority Schools in Quebec. The goal of the program is to provide students in minority language schools with opportunities to experience the arts ELAN will be overseeing the administration of the program and will be working collaboratively with LEARN to reach the 300+ English schools. We are seeking proposals from Communications Specialists to develop outreach strategies and design communications tools required to successfully launch a micro-grant program that aims to bring arts and culture in English-language schools in Quebec. Deadline for submissions is JANUARY 28, 2019. Click here for details. https://www.quebec-elan.org/wp-content/uploads/2019/01/Newsletters-2019.png 300 600 ELAN Communications https://quebec-elan.org/wp-content/uploads/2016/08/elan-final-logo-banner-1.png ELAN Communications2019-01-18 20:23:502019-01-21 17:20:27ELAN & LEARN are seeking proposals from Communications Specialists! The Quebec Writers’ Federation is hiring a writer to facilitate a Journalism Workshop for students aged 14 to 18. Deadline is JANUARY 15, 2019. Click here for details. Canada FBM2020 is hiring a committee that will plan and coordinate the literary programming for the Frankfurt Book Fair in 2020. Deadline has been extended to JANUARY 21, 2019. Click here for details. Independent music distributor Redeye Worldwide is hiring a full-time Account Representative. Click here for details. Repercussion Theatre is hiring an Operations Manager. Deadline is JANUARY 17, 2019. Click here for details. Youtheatre is hiring a General Manager. Deadline is FEBRUARY 1, 2019. Click here for details. The Dollard Centre for the Arts is looking for a Managing Director. Tentative starting date is FEBRUARY 11, 2019. Click here for details. Activités à venir en lien avec le Sommet des arts! Surveillez les événements et les activités à venir en lien avec le Sommet des arts, notamment de nombreux ateliers, appels à projets pour les artistes, séances de réseautage, partage de ressources, et plus encore ! Nous organiserons toute une journée consacrée au Sommet des arts, le 28 février 2019. Assurez-vous de mettre cette date à votre agenda ! Cliquez ici pour en savoir plus sur le Sommet des arts. https://www.quebec-elan.org/wp-content/uploads/2018/11/State-of-the-Arts.2.png 315 820 ELAN Communications https://quebec-elan.org/wp-content/uploads/2016/08/elan-final-logo-banner-1.png ELAN Communications2019-01-08 18:17:272019-01-08 18:19:20Activités à venir en lien avec le Sommet des arts! WE’RE BACK: HAPPY NEW YEAR! The ELAN team is back in the office and ready to take on an exciting new year! We look forward to sharing news with you about projects and advocacy, as well as delivering more practical workshops and schmoozers! 2019 also marks ELAN’s 15th anniversary and we have a lot to celebrate! If you haven’t had the opportunity yet, check out our 2018 year in review for a summary of last year’s feats and activities! https://www.quebec-elan.org/wp-content/uploads/2019/01/1-1.png 329 817 ELAN Communications https://quebec-elan.org/wp-content/uploads/2016/08/elan-final-logo-banner-1.png ELAN Communications2019-01-08 18:05:202019-01-09 16:19:57WE'RE BACK: HAPPY NEW YEAR! Guy Rodgers with Aaron Salomon, Andrew Tay, and Caroline Lussier at ELAN’s 2014 AGM! The beginning of a new year is a natural time to reflect on the past and imagine possible futures. ELAN had its busiest year ever in 2018. Arts Alive! Québec, managed by Anne Clark, co-produced multidisciplinary festivals in Hudson, Knowlton, Huntingdon, Wakefield and Quebec City, as well as a series of music and words events in libraries. Christie Huff and her ACE Initiative team launched a new series of Arts, Communities and Education projects to take artists into schools all around Quebec. June Park produced more than two dozen workshops in Montreal and the regions to enhance the skills of performing artists who aim to develop their professional careers, while Emilia Alvarez and Mariam Assaf arranged showcases in Canada, the USA, and the UK. ELAN’s increased activity necessitated the creation of a fifth full-time staff position. Jackie Stamp Smeaton joined us in December as our brand new Administration and Human Resources Manager. Jackie brings a wealth of Admin and HR experience to ELAN, as well as an artist’s sensibility. We also hired Lital Khaikin as Membership and Communications Assistant under a six-month Emploi Québec contract. Lital will work with Sufia Duez and Emily Enhorning to improve ELAN’s Communications and Membership services. The immediate project on the horizon for 2019 is State of the Arts, managed by Farah Fancy, with staff management by Amy Macdonald. ELAN was founded after a multi-disciplinary gathering of artists in 2004. In 2011, we met with the community again, which led to the development of many of the projects ELAN has worked on since. State of the Arts 2019 is designed to engage with artists and organizations we have collaborated with in the past, and to make new connections with artists and organizations who wish to collaborate with ELAN in the future. In 2019, ELAN will celebrate its 15th birthday. A few of you have been with ELAN from the beginning. It has been quite a journey and there is much to celebrate. We look forward to sharing memories with you, and exploring new possibilities.